Explore all the features of Elfsight Facebook Feed and how they can help you create the most effective widget. Running a business Facebook page with lots of precious content? It’s a must-do to embed it on your website and increase the reach of information. Get the public page URL or ID and copy-paste it into the special box on Source tab of our Facebook page widget editor. 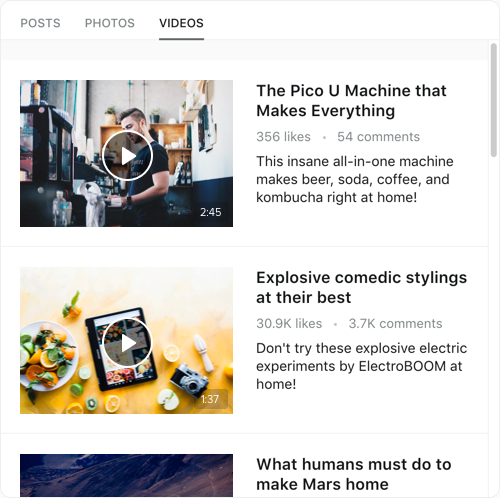 Now more people will have a chance to see and share your content. 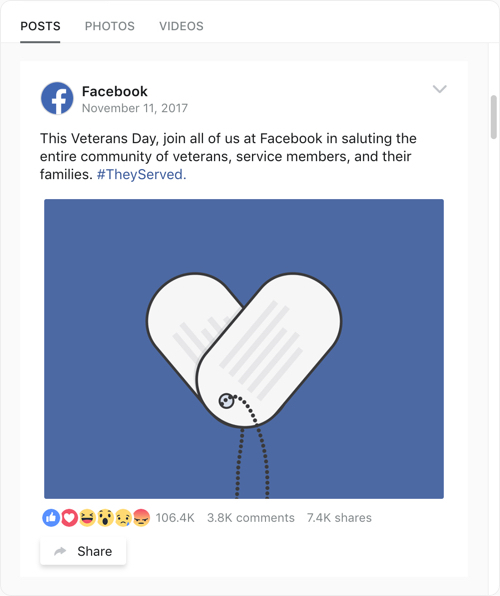 See a selection of real examples to explore the full potential of Facebook Feed for your website. Try all the features of Facebook Feed in live demo now. No fees. No registration. No coding. 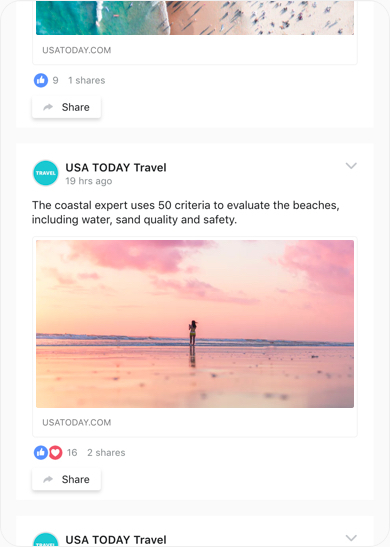 Creating your Facebook newsfeed widget, don’t forget to accompany it with counts of likes, and shares to demonstrate you are popular on social media and attract more activity. You are also free to enable your website visitors to share the content right from the feed, by showing Share button. All these options, as well as author name, can be easily switched off if you need. Tip: If your Facebook page is new and hasn’t got too much visitor activity on it, you can switch off the likes and comments counts in your widget. You can easily add Facebook photos to website. 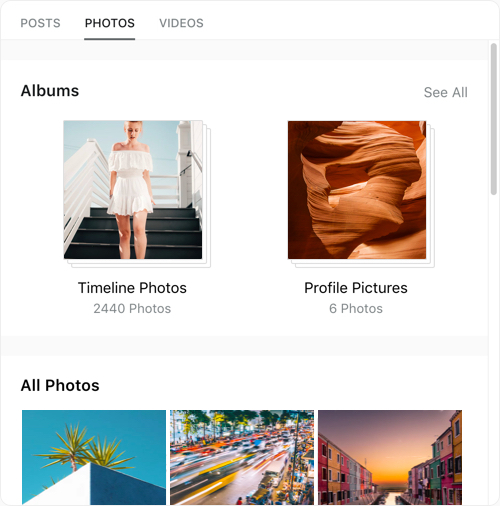 Show all photos together with albums or switch your albums off. All your pictures can be viewed in popup with author, date, comments and counts of likes and shares. Right from the popup, your visitors can share photos on Facebook, Twitter, or Google+. Tip: You can make your Facebook feed work as a photo widget. For this, you will need to switch off the header and menu and hide posts and videos. The photo feed will show only images and they can be nicely viewed in popup with slider. Switch on video description option, and your visitors will be able to read it, as well as see comments on click. You can also show likes and shares counts or hide it all for a minimalistic look. So, embedding Facebook video into website using Elfsight widget is pretty easy. Every use case has its own requirements to the scale of the widget, that’s why Elfsight Facebook Page Widget allows you to set the size, that is the most appropriate for you. You can change the width and the height of your news feed on Layout tab suit your content area. 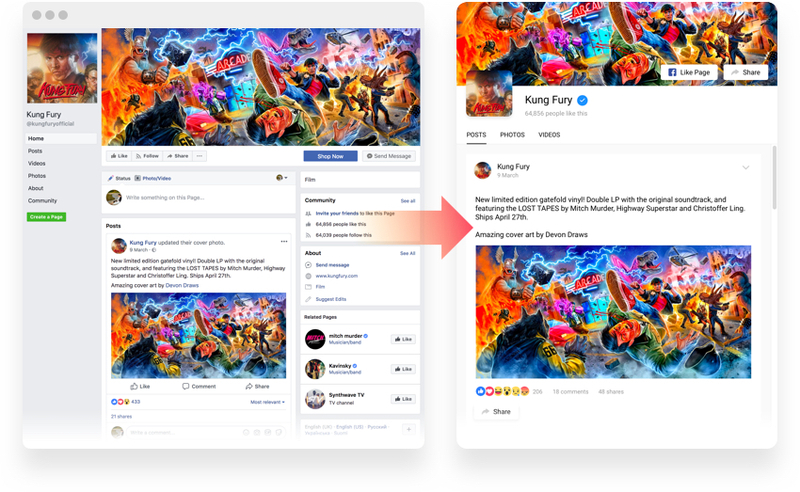 Elfsight Facebook Page Feed has automatic re-layouting depending on the set width and height. It adapts the content to the width of the feed widget and displays it in the most convenient for viewers way. Just try changing size settings and see how balanced the page widget looks with any proportions, including of course, mobile resolution. The header is one of the strategic elements of the live feed. Our widget offers its diverse customization to help you in any use case. Display or hide cover picture and page picture, as well as add call-to-action buttons and likes count to boast your high social popularity. Or switch the header off, to make a photo or video gallery or a news feed. 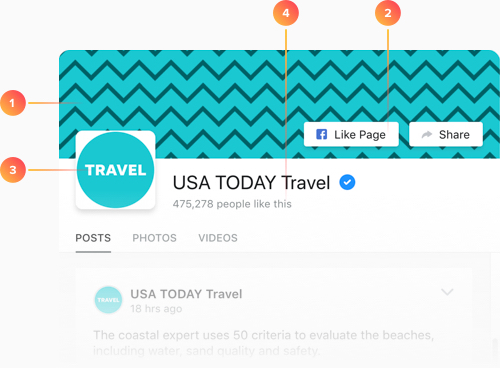 Tip: The header is one of the largest elements of Facebook live feed. If your space requirements are tight, you can disable the cover picture and save some precious space on the website. Make your content look impressive in full screen with awesome popup. 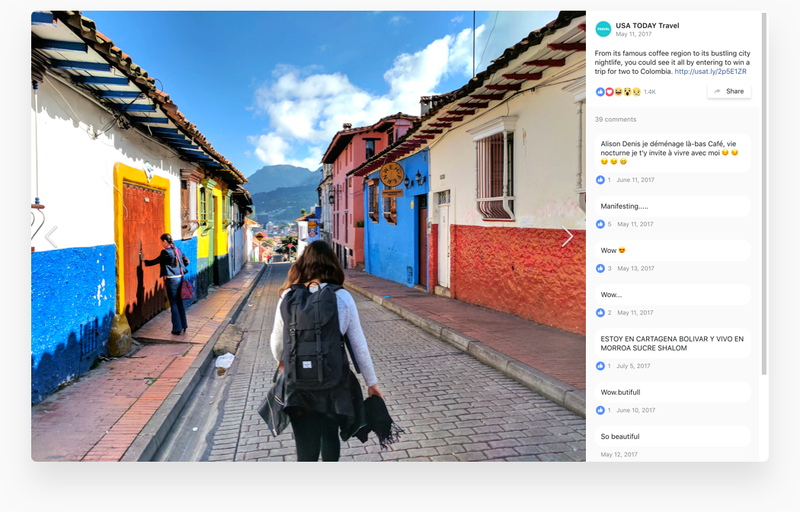 On a click, your visitors will see your photos and videos in full size with description, comments with emojis, like and share counts, as well as a Share button. The menu of your live feed is the element, that brings structure and helps to navigate easily, devividing content into the types. However, in the great diversity of use-cases, there are those, when you may want to hide it, and that’s why we made it possible in our widget. Simply switch it off on Layout tab and you will show only one type of content.